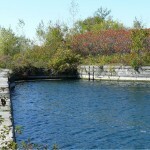 In the fall we went to Lock 28 on what used to be the Gallop Canal. 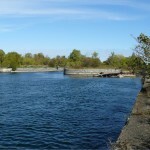 This was a canal near Cardinal Ontario that bypassed some rapids on the St. Lawrence River. I took a bunch of pictures at the time but forgot all about them until just last week. 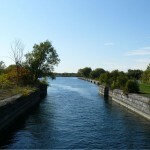 I was talking with one of my co-workers and the Gallop Canal came up. 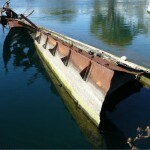 He is a scuba diver and has been to many of the wrecks on the St. Lawrence and I had mentioned that there was a small wreck at the Gallop Canal locks that I had been to visit. It wasn’t one he had been to before. This is part of the wreck of the Conestoga near Cardinal Ontario. These are the east gates on one of the locks. Looking back east to the two locks. You can see the wreck on the right hand side of the Wee Hawk. 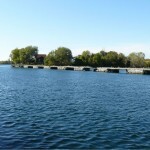 This appears to be an old pier at the west end of the locks. At the time, I took a picture of a large metal object off in the distance to the east of where we were. 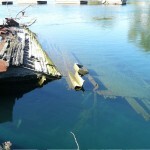 It turns out that this is the wreck of the Conestoga and one of the dive sites my co-worker has been to before. He hasn’t been to the locks but there were two groups of divers there the same day we were. It might not be an “interesting” dive compare to the wreck of the Conestoga but the little tugboat wreck and the old locks might be interesting in a different way. 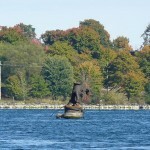 Updated: Turns out the “tugboat” is actually the wreck of the Wee Hawk which is a 50 foot wood and steel, work barge used in the construction of the St. Lawrence Seaway that was scuttled in the 1950’s. 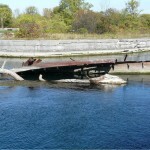 This entry was posted in Gallery, General and tagged Cardinal, Conestoga, Gallop Canal, Lock 28, Ontario, Scuba, St Lawrence Seaway, wreck on 2008/01/06 by Jeff Ivany.